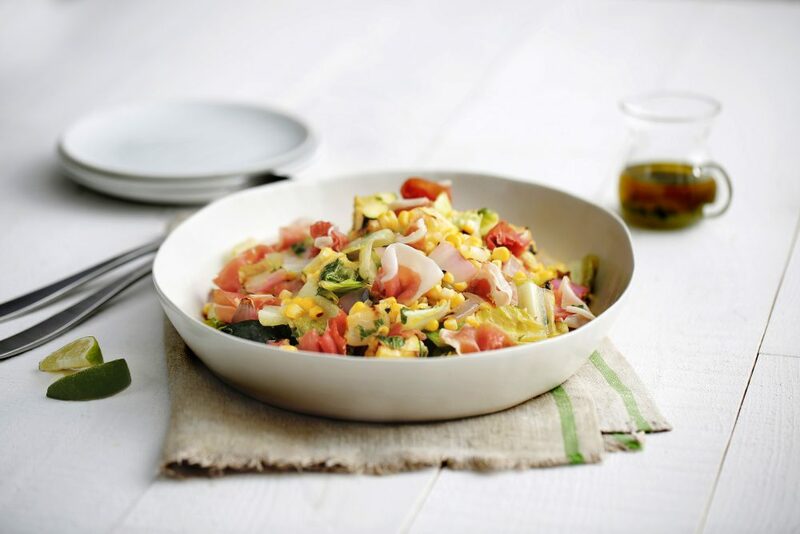 A prosciutto salad with smoky grilled vegetables is a deliciously light and tasty pairing. Perfect as a weeknight side dish alongside chicken or fish, these warm vegetables and silky prosciutto will melt in your mouth. This prosciutto salad also works perfectly as a light lunch—just skip the grilling of the romaine and add it in right before eating. Brush corn, zucchini, romaine and red onion with 3 tablespoons olive oil. Grill vegetables until tender, turning several times. Let cool. Cut corn kernels off of cob (1 cup kernels). Chop zucchini into bite size pieces (1 cup). Chop romaine into bite size pieces, discarding core (2 cups). Chop red onion discarding core (about 1 cup). In a serving dish or bowl, combine grilled vegetables and prosciutto. In small bowl, whisk remaining 3 tablespoons olive oil, lime juice, mint, lime zest, kosher salt and sugar until blended. Toss vinaigrette with vegetable mixture until evenly coated.